UNFREEZE 3 sheets of puff pastry. Prepare your kitchen countertop by adding some flour to it. UNROLL the sheets of puff pastry onto the flour. Make one big sheet by sticking the 3 smaller sheet of puff pastry together. You’ll need to do this by using a silicone brush and egg yolk. SMEAR the egg yolk onto the puff pastry edges, then attach them together that they form 1 bigger sheet. 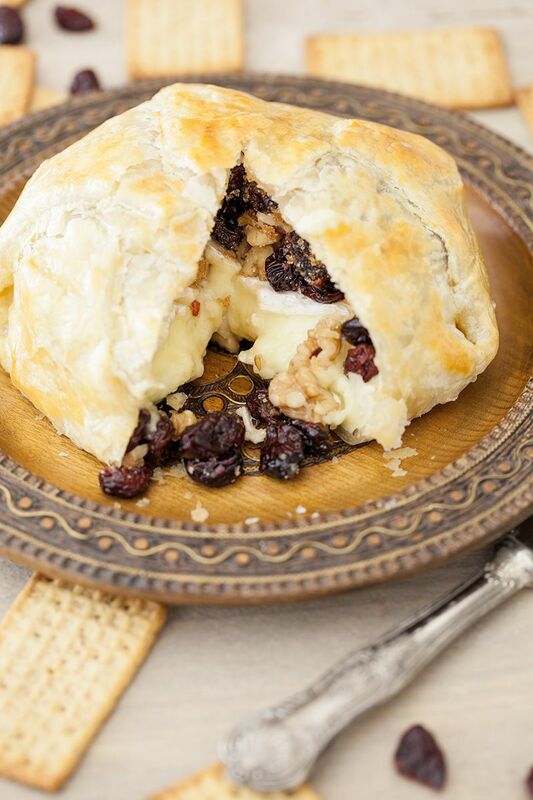 PLACE the camembert in the middle of the pastry sheet. BREAK unpeeled walnuts and quickly mix with the dried cranberries. 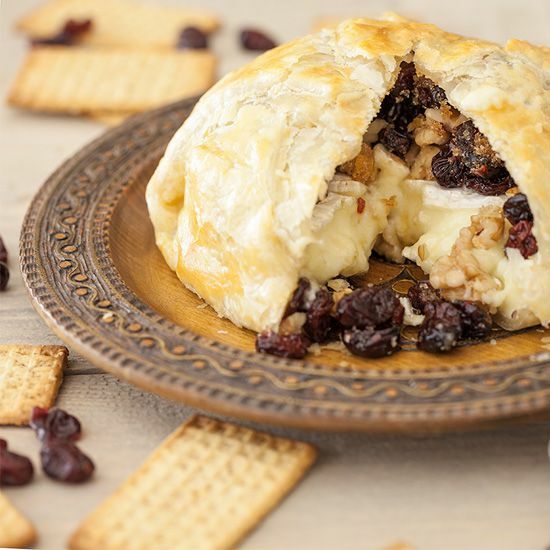 Place a handful of walnuts and dried cranberries on top of the camembert. Top it off with 1 tablespoon of caster sugar. PRE-HEAT your oven to a temperature of 200 degrees celsius or 392 degrees fahrenheit. FOLD the pastry upwards and inwards and completely seal the cheese. If you notice that the pastry doesn’t stay closed, you can smear some more egg yolk on the puff pastry edges. If that still doesn’t do the trick, check if the pastry sheet if big enough to cover the whole cheese. There’s not much to it, other than just putting it in the oven for about 15 minutes. 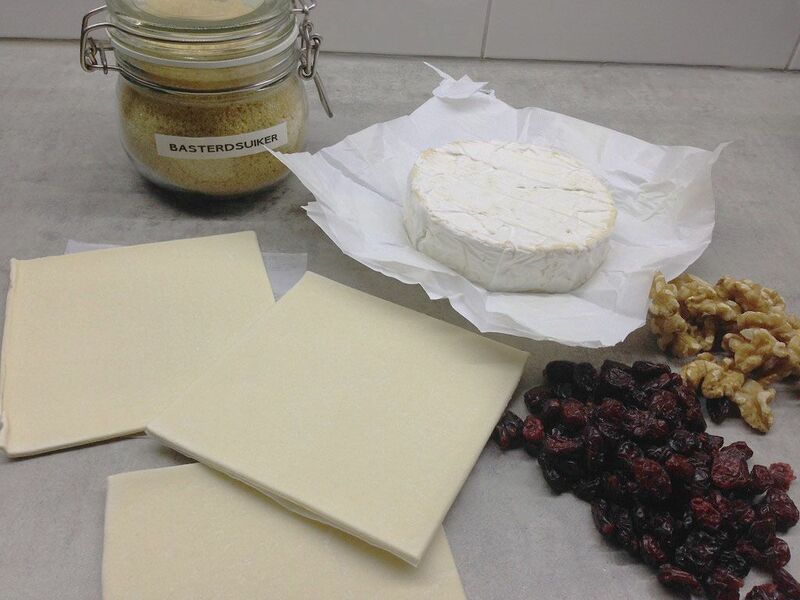 LINE your baking tray with greaseproof paper. Place the camembert cheese package in the middle. Use the “fan” setting on your oven and bake for about 15 minutes. 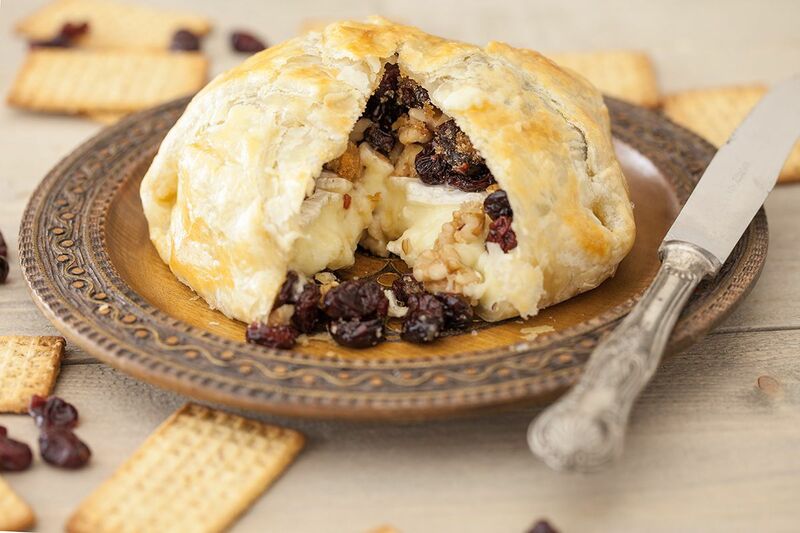 We’ve enjoyed this delicous camembert pastry package with some crackers and a nice glass of heavy red wine. Enjoy! Is it wrong that I want to eat this whole thing myself! Mmmm…it’s calling my name! Well… we tried exactly that, but it’s REALLY filling. Send us a picture when you succeed where we failed, hah! Oh god.. melting cheese wrapped in buttery puff pastry is basically my dream. This looks SO delicious and if I was to make the recipe – I definitely would not be sharing!